The European Intermediate eXperimental Vehicle (IXV) atmospheric reentry demonstrator. Japans Reusable Vehicle Test (RVT) series. Europe and Space Tourism - VEGA Group: review paper presented at a space tourism meeting on 7 June 2006 sponsored by the Royal Aeronautical Society. Development contracts signed for future European launchers - ESA - June.27.07. Airbus A380 Freighter could air launch space tourists - Flight Int. - Apr.28.07. Survey report on space tourism - Sam Adlen of the Vega Group. ARD - capsule launched to test thermal protection systems. Spacelinq.nl - A Dutch suborbital spaceplane project derived from the US Rocketplane. 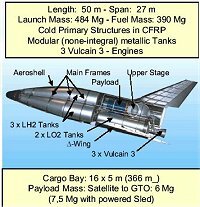 Air-launched manned suborbital vehicle - evolution of the X-38 lifting-body design. The vehicle would be the first in a series that led to an orbital system. Germany's reusable sub-orbital Hopper demonstrator. Hopper = Sled launched 2-stage demo system. First stage booster glides back, 2nd stage is expendable and takes payload to orbit. Phoenix = a prototype vehicle like the X-38 that will be dropped from a helicopter to test the autonomous landing system. Orbspace - Austrian based startup that plans to build a VTOVL suborbital vehicle. JetFly would provide a testbed for development of technologies for the Infinity. ESA and Thales Alenia Space establish agreement for development of Intermediate eXperimental Vehicle (IXV) - ESA - June.16.09. video showing how the mission would proceed. Additional info here. Project Enterprise - A privately funded project involving an alliance of the TALIS-Institute, Swiss Propulsion Laboratory (SPL), VEGA, and Xtreme Air GmbH. This project began in 2006 and was redefined in 2008. Involves a horizontal takeoff and landing vehicle for space tourism. The goal is by 2013 to see wo flights per week with 3 passengers each. 2-stage rocket with LOX/Kerosene engines. Small payloads to orbit. Equatorial 200-250kg and polar 100-150kg. BBC News | Sci/Tech | Thunderbirds are go! XBow II - 2 stage reusable suborbital with lift-off-mass of ~1500kg, powered by LOX/kerosene engines on both stages. Vehra-SH Suborbital Manned Vehicle by J.-P. Haigneré, L. Gathier, P. Coué(pdf) presented at the IAC 2006 (International Astronautical Congress) meeting in Valencia, Spain. These rocket powered vehicles resemble those in the Lunar Lander Challenge in that they hover and are fully reusable. a short distance and then returns for landing. From June 25, 2001. Press release info available at Spaceref.com. Reusable Vehicle Flight Experiment at Noshiro Testing Center - JAXA - Nov.7.03. 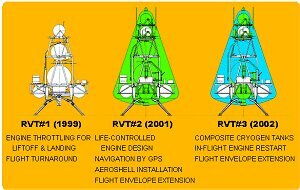 Flight Demonstration and a Concept for Readiness of Fully Reusable Rocket Vehicles by Yoshifumi Inatani - Space Future - discusses the history of the RVT and proposed follow-on vehicles. Space Tourism in the 21st Century: High Hopes, High Stakes - Space.com - June.29.01 - includes video of the test flight. Ddiscussed by Hiroyuki Ogawa of JAXA during a session of the International Personal Spaceflight Symposium in Las Cruces, NM in October 2007. New vehicle would be 10.5m tall, 3m diameter, 8,857kg GTW, 2619kg dry mass. 4 31kN engines, 315sec specific impulse. C&Space - suborbital Proteus vehicle. Six-seat spacecraft top of Russian space plan - New Scientist - Oct.25.05. Instant AKS - ("AKS" - avia-space system) Mig Corporation. Use maglev launcher. X-33 Aerospike engine in RLV History section Although, the X-33 program was canceled, the engine tests are considered a success. Aerospikes are ideal for SSTO since they provide efficient performance at ground atmospheric pressures all the way to vacuum conditions. However, SSTO development has been dropped by NASA in favor of 2 stage systems. In this case, each stage can have separate engines, each designed specifically for the conditions it will run under. Fuels and Space Propellants for Reusable Launch Vehicles - NASA Glenn Research Center - SBIR Program. A LO2/Kerosene SSTO Rocket Design Study Mitchell Burnside-Clapp, Feb.1997. Scratch modeling a SS1 at this Rocketry Forum thread. PRE-Flight Simulator. Download freeware PRE-Flight 2.00 from Simtel and SS1 Model from PreflightSim.com. See Rocket Companies in Shopping section.